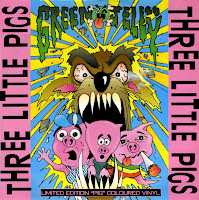 Green Jelly band members Marc Levinthal and Bill Manspeaker wrote 'Three little pigs' after a 'late-night drinkfest' at Zatar's in Hollywood. It is a re-telling of the classic fairy tale Three Little Pigs, with modern twists such as pot-smoking pigs, an appearance by Rambo and a Harley-Davidson-riding wolf. The song's claymation music video received regular rotation on MTV. As a result, it became a hit in various countries, reaching number 5 in the UK singles chart and number 15 in the Dutch Top 40. This single, released in the UK, was pressed on pink vinyl.